Following my previous post nazham.com on Twitter, I’ve just beginning to get involved with Twitter. 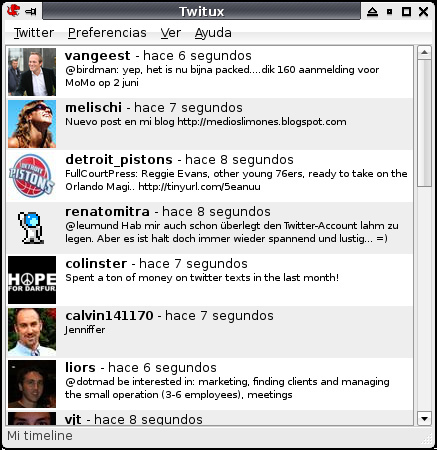 A Twitter client for GNOME. 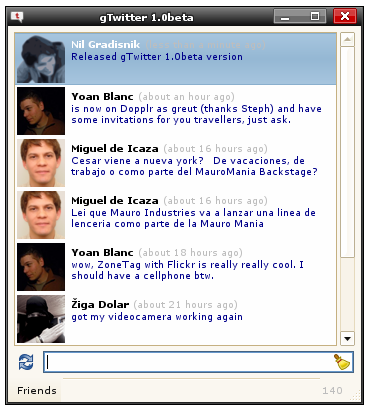 Twitux is a lightweight client for the twitter messaging service, featuring time-line auto updating, a tray area icon and notification of new messages. Client for tracking and posting to twitter. gTwitter is a client for posting and fetching updates to the twitter service. Installation is available through Synaptic Package Manager. Just do a search for the application name, twitux or gtwitter. Twitux is nice, but it is quite the resource hog. I just use the Twitter plugin for Pidgin. Twitter plugin for pidgin, hmmm… gotta try that one. Thanks.